Spring in the Big Easy gives you the chance to enjoy all that New Orleans has to offer before the summertime heat arrives. Here are our top ideas for exploring the historical, cultural, and natural attractions of the city and surrounding area. Discover the mountain of work that goes into New Orleans’ Mardi Gras celebrations on a behind-the-scenes tour. Hop aboard the Steamboat Natchez for jazz music, brunch, and Mardi Gras spirit on the Mississippi River. Enjoy the lovely, temperate weather with a bike ride or Segway tour around the French Quarter and along the waterfront. Head into the Louisiana countryside on a plantations tour. Take an airboat or kayak tour of the swamp and bayous that surround the city. See New Orleans beyond the French Quarter on a city tour that also takes in the Garden District and Hurricane Katrina sites. Immerse yourself in the historical atmosphere of the French Quarter on a horse-and-carriage ride. Gaze at the spectacular sights of New Orleans from the comfort of a luxury coach on an unforgettable 3-hour city tour. With a professional guide, cruise past historical highlights like the French Quarter and the Garden District while listening to illuminating commentary. 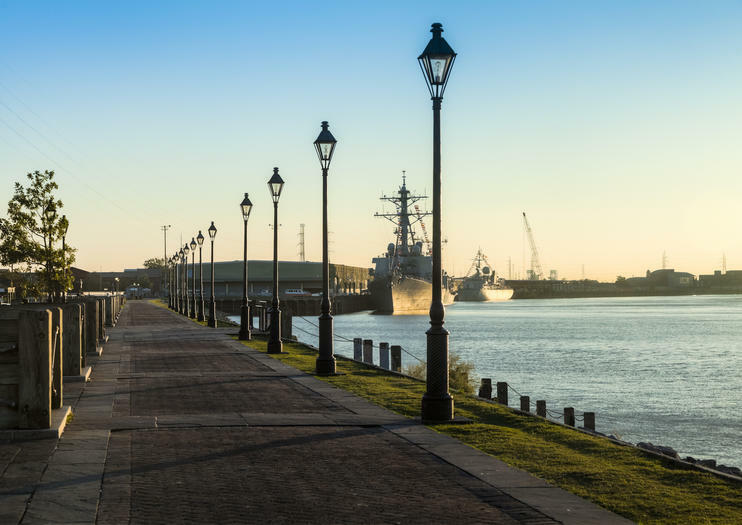 See the the lakefront area and the 17th street canal where the canal bank was breached by hurricane Katrina, and delve into the city’s rich history as you take a tour of the best museums in New Orleans. Enjoy the convenience of round-trip transportation from your hotel in Downtown New Orleans on this informative tour. Experience New Orleans’ wild bayou country on an exciting, family‐friendly airboat ride! This approximate 2‐hour boat tour winds through the mossy cypress swamp close to Jean Lafitte National Historical Park and Preserve, named for the 19th‐century pirate and smuggler. While onboard, enjoy lively commentary from a native guide as you admire lush, forested shoreline and spot local wildlife. Experience the civilized and the wild on a plantation tour and educational swamp boat ride from New Orleans. On this 5.5‐hour journey, visit Destrehan Plantation to experience the elegant antebellum south and then head into the marshy swampland for some wildlife spotting. Enjoy guided commentary as you snap photos of alligators, raccoons, snakes and native birds. Partake in a classic New Orleans tradition with a lovely jazz brunch aboard the famous Steamboat Natchez! Journey through time on this 2‐hour cruise along the mighty Mississippi. Stroll the deck, admire the iconic paddlewheel, and snap picturesque shots of the beautiful urban shoreline. This family‐friendly excursion includes a delectable brunch loaded with famous Louisiana dishes and live music from a local jazz trio. Opt for an alternative sightseeing experience of New Orleans during a 1-hour horse and carriage tour of the French Quarter, undoubtedly the city’s most captivating enclave. While your guide provides entertaining narration, you’ll canter past landmarks such as Jackson Square, Napoleon House, and St. Louis Cathedral. Plus, you’ll stop at St. Louis Cemetery — home to the tomb of Voodoo priestess Marie Laveau — for a short walking tour. Discover the beauty and history of New Orleans by bike on a morning or afternoon tour of seven eclectic neighborhoods. Enjoy a 3.5‐hour guided ride through the classic French Quarter and hip neighboring Faubourg Marigny. Cruise by the opulent Esplanade Avenue, St Louis Cemetery 3, City Park and more. Along the way, learn about the city’s colorful history from clashing colonial settlements and Creole society to contemporary culture. Wind through bustling and beautiful New Orleans on a fun and educational Segway tour! An expert guide will lead you through the colorful French Quarter, along the mighty Mississippi River, and to Louis Armstrong Park and Jackson Square, sharing insight into the city’s architectural history and diverse colonial heritage. Upgrade to a 3‐hour tour to include a visit to the Tremé neighborhood and Congo Square. Peek behind the curtain at the marvel of Mardi Gras with this tour of Mardi Gras World in New Orleans. See the behind-the-scenes work and incredible artistry that goes into preparing for the annual celebration. With a guide, learn the history of the event, and see fantastic floats and props. Get a picture in front of your favorite float, dress up in costumes, and sample some classic King Cake. Venture beyond New Orleans to the wilds of the Louisiana bayous on a small-group kayaking tour of the Manchac and Maurepas swamps. Climb aboard a tandem kayak and paddle through a lush landscape of cypress forests and wetlands teeming with wildlife. No kayaking experience is necessary, as a guide will teach you everything need to know to enjoy this Southern-style adventure. Take a break from the city on a classic Riverboat cruise with live jazz entertainment on board. Sweeping views of the New Orleans shoreline offer a perspective on the city that many visitors miss and an opportunity for frame–worthy photos. For visitors with more time to explore, options to upgrade include a sit–down brunch and/or an admission ticket to Mardi Gras World.